Artwalk Istanbul is an art project featuring a side of Istanbul off the beaten track. By simplifying and dividing the complex, yet unmissable art scene of Istanbul, Artwalk Istanbul presents you with an expert guide encompassing contemporary art galleries, institutes and contemporary museums and invites the viewer to the backstage of artistic practice with tours to artist studios; showing you a side to the city never seen before. It’s open to all, whether you’re from Turkey, or not, being an art enthusiast is sufficient for those wanting to get involved. 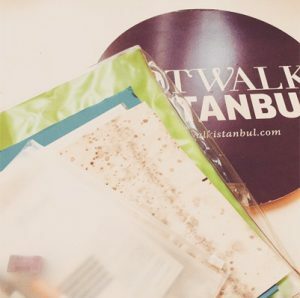 Artwalk Istanbul organise either GalleryWalk, StudioWalk, DesignWalk or StreetartWalk ones a month on Saturdays between 1-4pm. Please contact us for private walks, time and route details. Artwalk Istanbul team consists of young art professionals with extensive practical and theoretical experience of the current art scene, who are educated in contemporary art, art history, languages, sociology, art management and fine arts. The founders of Artwalk Istanbul are art managers Saliha Yavuz and Çiğdem Asatekin. The team, whose conflux is the online arts and culture publication GriZine, has refined and extended with new projects since its founding in 2012. All the team members who makes great effort to Artwalk Istanbul are personally and professionally sincere, next to being successful in their fields. Artwalk Istanbul’s guides are full of experience especially regarding contemporary Istanbul art scene, has extensive theoretical and practical knowledge on contemporary art and is a good art companion.